Founded in 1945, Seyfarth Shaw was among the earliest exclusive practitioners of what has become labor and employment law. From that start, and straight through today, Seyfarth’s Labor & Employment practice has been an innovator in this field of law. 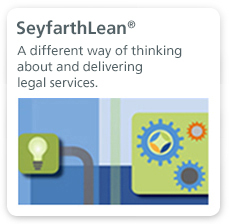 Unique among firms with labor and employment practices, Seyfarth organizes its more than 400 labor and employment lawyers in 12 team-based practice groups. The structure allows our teams to provide cost-effective client service to the broadest possible spectrum of employers. Our organizational structure allows Seyfarth to respond to the needs of publicly and privately held businesses ranging from the largest Fortune 100 companies to the smallest start-ups, as well as not-for-profit organizations of all sizes. In addition, unlike many labor and employment practices at other firms, Seyfarth’s Labor & Employment Department has depth in virtually all aspects of workplace law. In litigation, our firm defends employers in single-plaintiff lawsuits and in massive, multi-district discrimination, ERISA/employee benefits, and wage and hour class and collective actions under the FLSA and state laws. We also provide subject-matter counseling to solve workplace challenges covering the entire range of labor and employment issues, such as: hiring, testing, and FCRA compliance; workforce reductions; ADA, FMLA and state leave management; wage and hour exempt status, independent contractor and pay practices audits; eDiscovery systems and processes; and anti-harassment and other employment law training. Similarly, we have strong teams focusing on traditional labor matters; business immigration; OSHA compliance and reviews; affirmative action, pay equity and diversity; legislative and regulatory assistance; and international labor and employment matters. 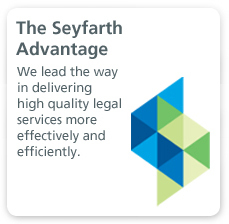 Our 14 offices strategically located across the country and in London, Shanghai, Melbourne and Sydney—including more than 135 labor and employment lawyers in California alone—offer clients assurances that when and wherever they need legal counsel, Seyfarth will be on hand to deliver it. Our passion for innovation and our determination to deliver exceptional value to clients has resulted in our SeyfarthLean® approach to labor and employment matters. For more information about SeyfarthLean®, click here. Our attorneys are not just helping our clients shape their future, they are also taking the lead in shaping the development of laws and regulations that impact the business community. With the recent addition of our Government Strategies and Public Policy Group, we continue to represent organizations such as the U.S. Chamber of Commerce, the Society for Human Resource Management, industry groups and individual employers in proposed legislative and regulatory changes. Seyfarth has offered input on behalf of clients into aspects of the National Labor Relations Act, the Americans with Disabilities Act, Title VII of the Civil Rights Act of 1964, the Family and Medical Leave Act, the Equal Pay Act, the Fair Labor Standards Act, the Employee Free Choice Act, the EEOC’s Guidance on Workplace Flexibilities, and the Genetic Information and Non-Discrimination Act. Seyfarth’s labor and employment attorneys produce a variety of publications across a broad range of topics. For example, the firm’s Annual Workplace Class Action Litigation Report is widely recognized as the leading national treatise that analyzes employment-related class action decisions. Organized on a circuit-by-circuit and state-by-state basis, the report covers class action and collective action rulings involving claims brought against employers in all 50 state court systems, including decisions pertaining to employment discrimination, wage and hour, and ERISA/employee benefits laws. The firm publishes benchmark white papers, such as California Cal-Peculiarities: How California Employment Law Is Different and Recent Trends in California Wage and Hour and Labor Code Class Actions. Because of differences in Massachusetts law, we have also written an in-depth white paper on Massachusetts Wage and Hour Peculiarities. Seyfarth’s Wage & Hour Litigation Practice Group has published a comprehensive treatise on Recent Trends in Defending Federal Wage & Hour Complex Litigation. The firm also publishes quarterly the California Labor & Employment Law Update and the Massachusetts Employment & Labor Law Report. Our Labor & Employment Department is consistently ranked at or near the top in labor and employment law rankings across multiple practice areas in the United States and internationally. Chambers USA ranks Seyfarth among the top L&E firms nationally, and we are one of only three firms that have been ranked by The Legal 500 in all six national Labor & Employment categories. We are routinely recognized by Law360 as an “Employment Practice Group of the Year,” and our employment litigation capabilities have earned us recognition in the annual BTI Litigation Outlook as a “Standout" Employment Litigation Practice. Our Labor & Employment Department continues to be recognized regionally, nationally and internationally by Chambers, The Legal 500, Law360, U.S. News & World Report: Best Lawyers, The National Law Journal, and BTI Consulting Group. We have consistently landed a spot among the notable firms on Law360’s annual "Employment Practice Groups of the Year" list. Law360’s "Practice Groups of the Year" recognitions highlight up to five practice groups that notched the biggest litigation victories or deals of the year. Our consistent position on the list reflects the firm's success in securing major precedent-setting decisions and helping to defuse cases against high-profile defendants. 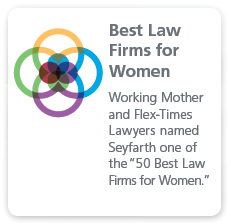 Seyfarth has also been noted as a “Leading U.S. Law Firm” by The Legal 500 has been recognized as one of only three firms ranked in each of The Legal 500’s six workplace law categories. Based on our comprehensive and cross-jurisdictional national labor & employment law and employment litigation capabilities, U.S. News & World Report: Best Lawyers “Best Law Firms” has ranked Seyfarth’s Labor and Employment department as a top tier national practice in the “Employment Law–Management,” “Labor Law–Management,” “Litigation–ERISA,” and “Litigation–Labor & Employment” categories. In addition, Seyfarth has been routinely singled-out for “Standout” honors for Class Action and Tort, Complex Employment Litigation and Routine Employment Litigation in the annual BTI Litigation Outlook studies, which named us a “Powerhouse” firm for Complex Employment Litigation. Based on the feedback of 300 in-house counsel, Seyfarth ranks among the top litigation firms in the country in the BTI Litigation Outlook series”. Seyfarth Shaw’s Employer Labor Relations Blog provides a one-stop resource for employers to stay current on developments in traditional labor law and labor relations, including recent NLRB and court decisions, legislative and regulatory updates, and labor relations and collective bargaining current events. Seyfarth Shaw’s ADA Title III News & Insights Blog is the essential accessibility law resource for every business that opens its doors to the public. Seyfarth Shaw’s California Peculiarities Employment Law Blog is a unique resource for employers navigating the peculiarities of California employment law, who face real issues on a daily basis and need practical solutions to address them.